A report into Norway’s 2013 Gudvanga Tunnel fire makes uncomfortable reading but the authorities say all the recommendations either have been, or are being, put into practice. Also, a new warning will appear on French motorways about ‘wrong-way drivers’. Will the Netherlands be the next to introduce a minimum wage law for all truck drivers? Monster fine for truck driver in France. New ‘dynamic’ truck parking info in Germany. Authorities says recommendations are already in hand. Photo Monika Blikas, from Statens Havarikommisjon for Transport report on Gundvanga Tunnel fire, aibn.no, see below. The report into the Gudvanga Tunnel fire – in which 67 people were trapped and 28 injured, five of them seriously – comes to several damning conclusions. 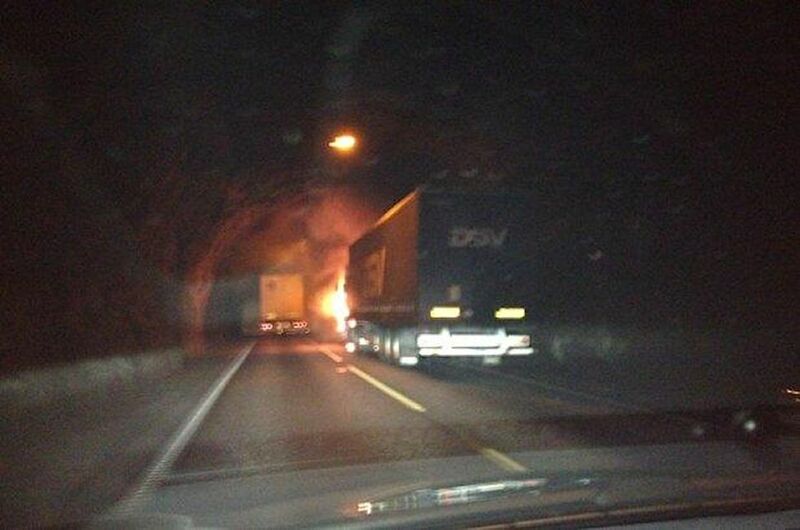 On 5 August 2013, a Polish-registered truck caught fire in the 11.4km tunnel – on the E16 between Bergen and Oslo – 3.5km from the eastern entrance. The report, published today, says the lack of monitoring equipment meant the fire service had no idea how many people were inside, or where they were located. When smoke was ventilated westwards according to a pre-determined rescue plan – through 8.5km of tunnel – it ‘blocked the only possible evacuation route for road users on the Gudvangen side of the fire’. Further, there was no way for the authorities to communicate with drivers. Only those in the immediate vicinity realised what was happening. Worse, the communication network used by rescuers was out of action and the incident commander, apparently, was not in the command centre. Finally, the tunnel design and technical equipment ‘did not adequately facilitate self-rescue’, i.e. there were no ‘safe areas’ for people to congregate. In a brief statement, the Norwegian Public Roads Administration said the six recommendations made in the report were all in hand. Despite an overall road safety record which compares well with the UK, concerns have been raised previously about the condition and facilities in some of Norway’s road tunnels. The 2012 EuroTAP Tunnel Test rated several as ‘poor’ or ‘very poor’. Shortly after Gudvanga re-opened, a month after the fire, a £10.5bn roads rehabilitation programme was announced. Tunnels are the top priority with 200 to be either renovated or replaced completely by 2019. Gudvanga Tunnel, 90 miles north east of Bergen beside the noted Naeroey Fjord, opened in 1991 and is Norway’s second longest. By contrast, Laerdal Tunnel, also on E16 between Bergen and Oslo, the world’s longest at 24km and opened in 2000, is considered state of the art. Download the report here, including a summary in English. roundup: NETHERLANDS could be the next country to introduce minimum wage rules for all truck drivers working on its territory. Employment minister Lodewijk Asscher is reportedly examining the possibility. Germany introduced a similar law on 1 January – since suspended for transit drivers pending an EU investigation – and France is shortly to follow suit. The Dutch minimum wage is €9.02 per hour. FRANCE. A truck driver from Serbia was fined €38,870 on the A7 in the Vaucluse region of south central France this week after being found to have had just 6h22 sleep in four days reports @Gendarmerie. The driver was prosecuted for 53 offences in total. GERMANY. A new ‘dynamic’ parking system has been installed at five stops on the A5 southbound to Basel, Switzerland, by SWARCO AG. A total of 115 signs have been installed to give drivers advance notice about the number of vacant spaces and to cut down the time spent searching. The information is also available online, for free, here.